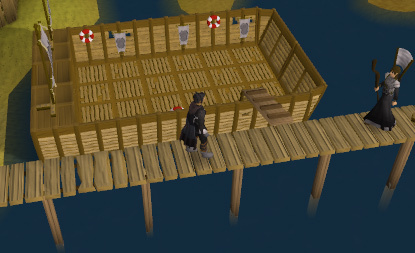 The Void Knights' Outpost is located on a small island south of Ape Atoll. 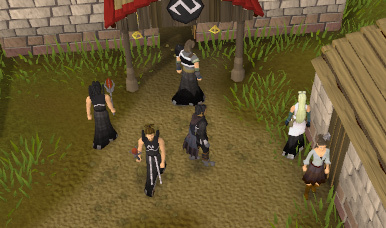 It is most known for being home to the Pest Control minigame. Although, it is also home to several shops and other useful buildings, as well as a Squire who will repair your Barrows armour and other items. 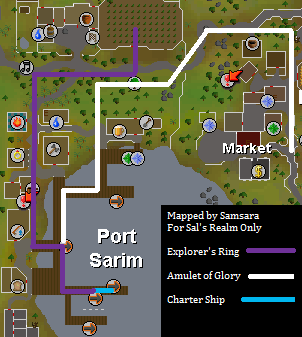 The fastest way to get there is to use an Explorer's Ring 3 to teleport north of Sarim and walk. 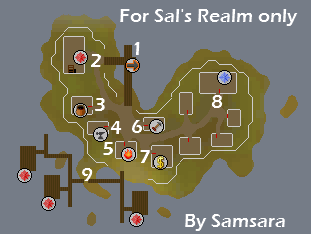 You can also use an Amulet of Glory to teleport to Draynor Village and walk to Port Sarim from there. 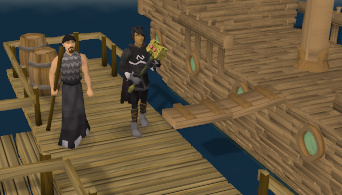 You can use the Charter Ship system to sail from any port to Port Sarim. 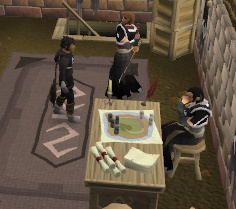 If your house is in Rimmington, you can use the Teleport to House spell (or a tablet) and walk east to get to Port Sarim. Once you get there, talk to the Squire and say “I’d like to go to your outpost.” to set sail to the outpost. Alternatively, you can right click on him and select “Travel” for a quicker method of getting there. In this building is where the Conquest minigame takes place. Talk to Captain Ethar for a tutorial. Talk to Knight Dorian to recruit your troops, change your Commands, and change your formation. Once you are ready, go downstairs to play the actual game. A Combat Level of 40 is required to play Conquest. The squire in here will repair pickaxes, hatchets, broken armor and weapons, and Barrows armor. In here are also two anvils that you can use. 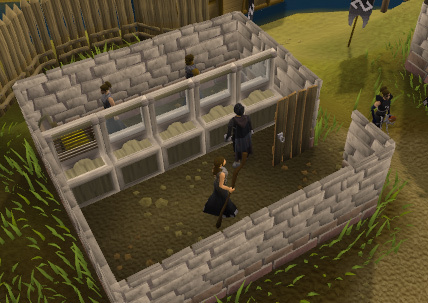 This bank is just like any other bank in RuneScape, however there is one major difference. 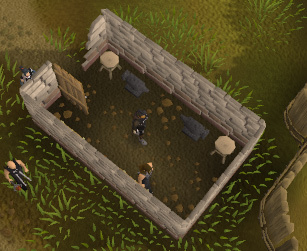 This bank is free of random events, so this makes it a great place to fletch or High Alchemy without being interrupted. Talk to Captain Tyr to start the quest A Void Dance. There are three landers on the southern end of the Void Knights’ Outpost, and all three of them are for Pest Control. To play Pest Control, board one of the landers and wait until enough people get on to start a game. The landers are split up into three categories: Novice, Intermediate, and Veteran. Each lander has its own specific requirements. For the Novice lander, you need to have a Combat Level of at least 40, and you will get 2 Commendations every time you win a game. For the Intermediate lander, you need to have a Combat Level of at least 70, and you will get 3 Commendations every time you win a game. For the Veteran lander, you need to have a Combat Level of at least 100, and you will get 4 Commendations every time you win a game. You must deal at least 500 points of damage in a game of Pest Control to receive Commendations for winning. 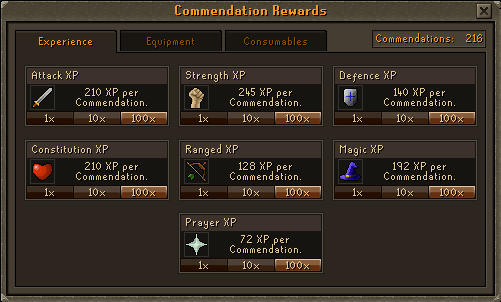 Upon victory in either of the minigames on the outpost, you will get a set number of Commendations. These Commendations can be cashed in for experience, armor, or items. To cash in a Commendation, talk to a Void Knight or Squire and ask them to exchange your Commendations. 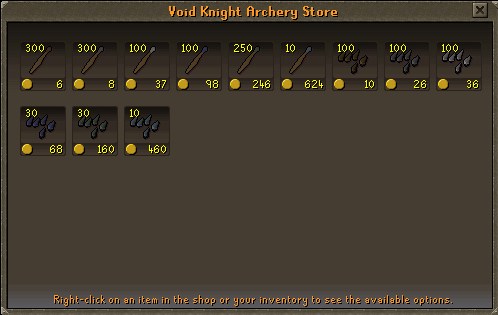 You can also right click on a Void Knight and select “Exchange” to see the Rewards menu. Once you are at the Rewards menu, as you can see there is a vast variety of rewards to choose from. You can gain experience in Attack, Strength, Defence, Constitution, Ranged, Magic, and Prayer. To gain experience in any skill, you have to have a level of at least 25 in that particular skill. The amount of experience you gain when trading in Commendations is proportionate to your level in that skill. The higher your level, the more experience you will get. Less experience is given when trading in Commendations for Prayer than in any other skill. To purchase equipment with your Commendations, you need level 42 Attack, Strength, Defence, Constitution, Ranged, Magic, and 22 Prayer. The Void Knight Mace can be used to cast Claws of Guthix, and it also gives +10% Magic Damage. 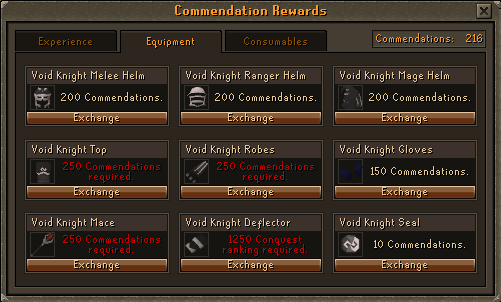 To purchase the Void Knight Deflector, you must have a ranking of 1,250 or higher in Conquest. Once you achieve that ranking, it costs 150 Commendations. The Void Knight Seal can be used in Pest Control to deal 100 points of damage to nearby enemies. It is worn in the amulet slot and only has 8 charges before it depletes and crumbles. When wearing at least 4 Void Knight armor pieces (including one of the helmets, the Void Knight Mace and the Seal do not count), you receive a set effect for your armor. 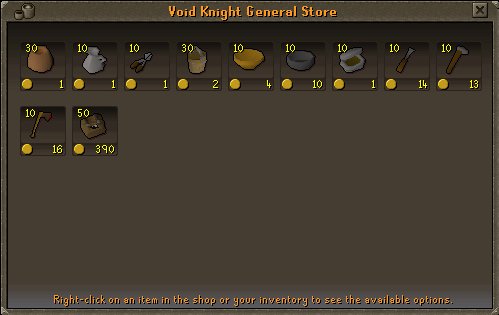 When wearing the Void Knight Melee Helmet and 3 other Void Knight armor pieces, you receive a boost of 10% in your Melee accuracy and damage. 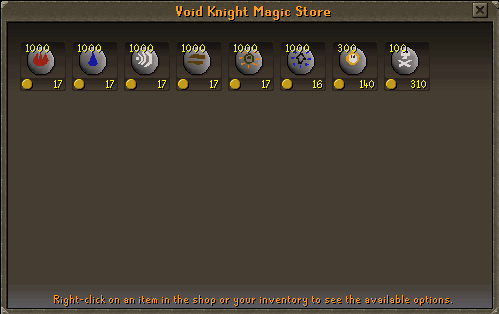 When wearing the Void Knight Mage Helmet and 3 other Void Knight armor pieces, you receive a boost of 30% in Magic accuracy. When wearing the Void Knight Ranger Helmet and 3 other Void Knight armor pieces, you receive a boost of 20% to Ranged accuracy and damage. Herb Pack - 30 Commendations. You need a Herblore level 25 to buy this. This contains an assortment of random grimy herbs. 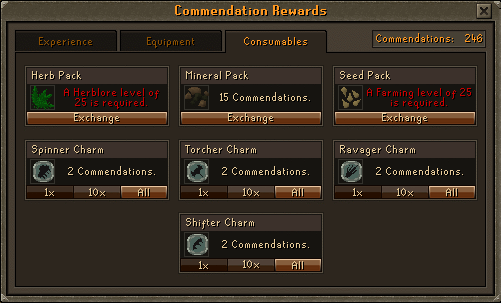 Mineral Pack - 15 Commendations. This usually contains 25 Coal ore, and 18 Iron ore. Seed Pack - 15 Commendations. You need level 25 Farming to purchase this. This usually contains 2 limpwurt seeds, 6 tomato seeds, and 3 sweetcorn seeds.